To begin with, in the movie of Mel Gibson we realize that he doesn’t know anything about the Spiritual World because he calls “Christ” to the Master Jesus, and we know that “The Christ” is a Divine Energy of the Plane 7. Jesus on the other hand, was in that time a spirit of the plane 4. At the present time Jesus is the current Solar Logos inhabiting the plane 5.9. In addition, when people say that Jesus died for all of us, it’s also a mistaken concept, since karmas are personal because each one is responsible for his own actions. Jesus himself said once that “each one will emerge by his own effort” this saying was obliterated from the Bible. If Jesus hadn’t been crucified, his messages would have been like so many other messages. Jesus is precisely remembered by his Martyrdom. Therefore, when he died his messages of Light trascended throughout time. This was precisely his mission, it is necessary to emphasize again that he didn’t die for anybody. 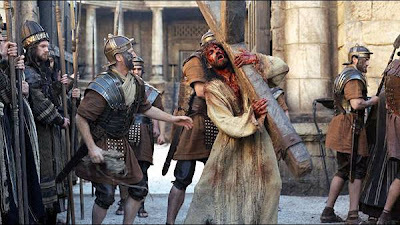 Interlocutor: There are many people who have asked me if the movie of Mel Gibson, “The Passion of the Christ”, depicts with accuracy the cruelty of the tortures the Master Jesus had to suffer. Ruanel: First of all, let’s move to that time, where the human being is not more violent than he is today, but rather he was less educated, more uncivilized. The phrase “symbolic punishment” to a Roman sounds so absurd as if today an Iraqi gave flowers to an American. Interlocutor: I understand the irony perfectly. Ruanel: The punishment was real, it was brutal just like the movie depicts. Interlocutor: But how he could resist that punishment? I understand that he was very weakened. Ruanel: The Master Jesus had a great physical constitution and for that reason his organism could stand the lashes and all the punishments the torturers inflicted to him. Interlocutor: Was that movie somehow suggested or influenced from the planes of Light? Ruanel: Directly it was a biographical movie, although some things are not true. Interlocutor: In which sense, for example? Ruanel: For instance, Mary the mother of Jesus, in the movie she plays the role of a fighting woman commanding and guiding the apostles while Jesus was in prison, this is not true because she had a lower profile and a much lower character. If Mary had had a so strong character as the movie showed, she would have had prominence over Jesus and she never had it. Jesus many times recriminated her requesting her that she allow him to accomplish his mission, since his mother was permanently on him saying things like: “look! they are going to kill you”, “be careful”, and she was always obstructing him. There is even a very well-known episode which is in the Bible where Mary appears with his brothers and Jesus doesn't want to see her. Interlocutor: Yes, I remember it very well. Were the Jews responsible for the death of Jesus or the Romans? When I refer to the “Jews”, I’m referring to the spirits that embodied in Jewish bodies. Ruanel: With all respect for those spirits who embodied in Roman bodies. Even some of them in that time now are Spirits of Light because they learned the lesson of Love, they were the “useful idiots”. Interlocutor: Should I write it down in that way like “useful idiots”? Ruanel: Yes, write it down like that, because this expression is the one that describes better the role they played in the crucifixion. But the main people responsible were those who embodied in the roles of Jews. I repeat the expression “embodied in the roles of Jews”, because in a later life they have been Catholics, Muslims, Protestants, etc. Interlocutor: And Are some of them beings of Light also? Interlocutor: It is perfectly clear. Before to conclude with the topic, Is the movie anti-Semitic? Interlocutor: Did the director want to make an anti-Semitic movie or it was not his intention? Ruanel: No, his idea was to depict the Passion as it was. Interlocutor: Did he achieve it? Ruanel: Yes, he achieved it and in a quite high percentage. Ruanel: Something less, let us say 80%, because there are many things that are fictitious. For example, when Jesus is in Gethsemane, you can see Death characterized by a woman. in fact Death doesn't exist as a real character, or you can see to the Devil disguised as a woman, and we know that the Devil in the spiritual world doesn't exist. The only thing that exists are “demons” and spirits of error. Interlocutor: I understand. As to the atrocious suffering of Jesus, Does the movie depict it in a 100% or is it short? Ruanel: No, it’s not short. The real suffering was depicted in a 100%. In this sense the film doesn't have breachs. Besides, it is the rawest movie that has been made about Jesus calvary. Interlocutor: I believe that this topic is over and I’ll move on quickly to another topic because I have many questions to ask. Recently scientists have examined the shroud of Turin and they have found a second face of Jesus. Is there something real on this? Ruanel: No, everything is false, there is no second face. Interlocutor: Is it totally a fantasy? Interlocutor: And how have they arrived to this conclusion? Ruanel: To become famous nothing else. Interlocutor: But then they are cretin? Ruanel: It’s the word that better fits to them. Interlocutor: It is difficult to believe that they have made something so coarse. Ruanel: You believed it, didn’t you? Interlocutor: Well, I realize that I did. I thought that it could be true. Is Everything only a trick? Ruanel: Correct, there is no second face. Interlocutor: Was there intervention of the spirits of error? Ruanel: Yes, they influenced them in their ego. Interlocutor: Let’s see if I understood well. Do they know that it is a trick or they are also being deceived? Ruanel: One of them knows that the second face is false, but the rest don’t know it and they were dragged. One of them said: “look at this, there is a second face of Jesus”, and the rest of them with their feverish mind, agreed with that and they also “saw” the second face. This happens often in the spiritualistic schools, where one of the present says: “I see a shape behind the medium of this characteristics, with this dress, with a long and pointed beard, eyes of this color” And it happens that all the rest also see the same thing, being that it is only imagination of their mental decoders. Interlocutor: Perfect... The first question that I want to make is if Mary, the Mother of the Master Jesus is his Soul Mate. Johnakan Ur-El: Absolutely not, because being incarnated many times they have even become enemies. The beautiful mother of the Master was too possessive and the Love she had for Jesus was personal, not impersonal, then practically she was not interested in the messages at all, but to keep the life of her son. Interlocutor: At this moment I remember something that I always wonder. What did the Master Jesus mean exactly when he mentioned the word “hate” I refer to the versicle when Jesus said: “If anyone comes to Me and does not hate his father and mother, wife and children, brothers and sisters, yes, and his own life also, he cannot be My disciple” Concretely what did he mean with that expression “hate”? Ruanel: He meant to detachment. But detachment doesn't mean to stop having personal love, because personal love is an inherent love in the human being. For example, if you suddenly have personal love for your grandson, detachment means that you would allow him to leave, in the case he had to undertake a career far away from you. Then, you would not obstruct him because you would be happy seeing that he’s happy as well. Ruanel: That is what Jesus was expressing. We are not speaking of “hate” in the sense of hatred. Interlocutor: It is clear, Master. Ruanel: Detachment doesn’t mean that you will stop loving somebody either. Detachment means that the other doesn’t have control over one so that one is able to accomplish his mission. That is what Jesus meant. Interlocutor: Then, the Master Jesus meant that one has to be detached from family without stopping loving them and at the same time being able to serve others. Interlocutor: I find brilliant that phrase of the Master Jesus, I also believe that definitely a father, mother, siblings, etc., they are only mere roles that belong exclusively to the physical plane because in the spiritual world there are no relationships of this sort. Ruanel: Yes that interpretation is correct, but the roles, in fact don't bother, whenever one marks the limits, of course. Ruanel: While one knows how to handle ego, the roles won't have influence on one. All the incarnated beings are entitled to have relationships, roles, and that’s not bad, because when you embody you play a “movie”, and a movie has characters. It’s not bad to enjoy those roles, as long as those roles are not an obstacle. Why would you prohibit those roles, if they don't bother? Another thing would be if the attachment to those roles prevented for example to be merciful, because in this case they would be negative roles, abjected roles. Ruanel: If you are involved with a person, even if it’s a role, as long as it doesn’t prevent you to accomplish your mission, it’s fine. The personal love for somebody, the ties that are formed, while they don't bother it is perfect. Interlocutor: What happened to the family of the Master Jesus that impelled him to say what he said? Ruanel: The mother of Jesus was very possessive, too possessive. In the last years of Jesus’s life, especially in the last two years, practically she bothered him, she made his life impossible. That’s why Jesús didn't want to cope with her. Then he used to go to preach where he was not bothered, in the fields, in the mountains. Ruanel: Keep in mind that those so possessive roles after all strengthen, those roles teach vastly. Interlocutor: Yes, of course. I remember a very well-known phrase that says: "what doesn't kill you, makes you stronger"
Interlocutor: Now I want to ask you if John Zebedee traveled to some place in the Himalayas to seek for knowledge when he was embodied two thousand years ago? Kether: From the moment that the laudable Master Jesus disembodied, who is a great representative of Love and very well-known in the planetary system of Ani, among many others. The Master Johnakan Ur-El, being incarnated as John Zebedee, who was 18 years younger that his Master in the physical plane, in the period he took care of the biological mother of Jesus, practically he was committed to the task of taking care of Mary, the mother of the Master. But when Mary disembodied, he went to seek more knowledge. Interlocutor: How old was he when he left? Kether: He would be already 26 or 27 years old. Interlocutor: How old was he when Jesus died? Kether: Around 18 years old. The most important thing of all of this is that he has traveled to different lands. He went through part of the Himalayas, but he didn’t contact with any group effective in this time. All the groups that today say that they have known to John Zebedee in the antiquity are only fantasizing merely for commercial purposes. This entry was posted at Thursday, October 08, 2009 and is filed under Biblical mysteries . You can follow any responses to this entry through the .